Vincent Houdijk and Vinnievibes are quickly growing their following and reputation as one of the most exciting and engaging live act in the contemporary jazz fusion scene. Their studio releases are absolutely praiseworthy, but there is something even more electrifying about their live shows. 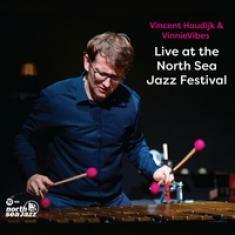 Recently, vibraphonist Houdijk and his band had the amazing opportunity to join the line up of the prestigious North Sea Jazz Festival, one of the most notable music events throughout the world of jazz enthusiasts and beyond. Houdijk's beautiful performance has been captured for Live at the North Sea Jazz Festival, and I really love the outstanding vibe of these recordings. The set list consists of seven songs, and each performance is loaded with passion, instinct, and technical proficiency. On songs such as "Vortex," Houdijk set out to push the limits of groove and rhythm, while on "Timeline" he has a different grasp on his melodic sensibilities. All in all, this release is a vivid snapshot of Houdijk's versatility as a musician, making for a really unique testimony of the artist's outstanding live performances.